In 1920, the year that Irving Langmuir coined the term "plasma", the British astronomer Sir Arthur Eddington was already developing the nuclear fusion model of stars. The first step in Eddington's reasoning was a simple question: Does the power that makes the stars shine come from the stars themselves, or does it come from somewhere else? And the answer he chose was that the power that makes the stars shine comes from the stars themselves. With that assumption, he laid the foundation for the now-accepted theory of stars powered by fusion within their cores. This theory has been developed over the last 80 years into an all-encompassing model of stellar evolution and is deemed to be the proven explanation of what makes the stars shine. But a lot of new data and a lot of new ideas have come to bear on that foundation since 1920, and a number of scientists think a stronger and larger foundation is needed. The Electric Universe model, following C. E. R. Bruce and Ralph Jeurgens, proposes a new theory that takes into account all that has been learned about plasma behavior in the laboratory and in space. We ask Eddington's question again: Does the power that makes the stars shine come from the stars themselves, or does it come from somewhere else? And the answer we choose is that the stars shine because they are connected to the electric circuitry of the galaxy. An electric star's brightness depends on the power of the electric current feeding it, not on the amount of nuclear fuel it has available to burn. Consequently, an electric star doesn't evolve. 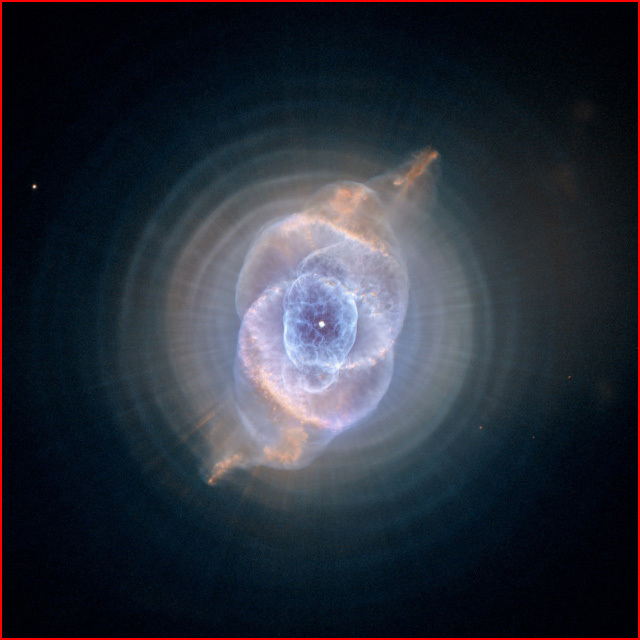 In the nuclear view, a "planetary nebula", such as the one which produced the intricate Cat's Eye Nebula (image above) is the "death throes" of a star that has run out of nuclear fuel. In the Electric Universe view, a planetary nebula is an overload, the flare-up of a star under abnormal electrical stress. The filamentary cellular structures seen here are characteristic of plasma behavior. Among those characteristics are concentric spheres, rays, intertwining spirals, bubbles formed of filaments and networks of filaments, and dusty pillars. The most striking feature of the central part of this nebula is its polar symmetry. This is where the galactic Birkeland currents that feed the star "pinch" down into a galactic thunderbolt. The shape is similar to those of Zeus's thunderbolt drawn by ancient astronomers. The electrical stress no doubt produces massive nuclear reactions in much the same way that we produce nuclear reactions in a laboratory by bombarding targets with electrically accelerated particles. And in the same way the reactions occur on and near the surface, not in the core. Because the Cat's Eye Nebula is composed of plasma instead of merely hot gasses, its structure and development are consequences of electrical discharge rather than of an explosion and shock waves. The source of the energy is not the star at the core of the nebula, but the same galactic electric circuit which created and powered the star throughout its life.